This recipe takes several ingredients that one might use to make a delicious pear salad and incorporates them into a pesto-like stuffing for chicken. 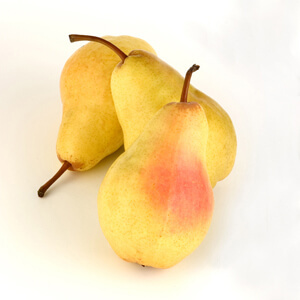 The filling consists of sweet pears, salty pumpkin seeds, earthy arugula, and big, crumbly chunks of dry Jack Cheese. Dry Jack is simply an aged version of Monterey Jack cheese, and is sometimes described as having a butterscotch flavor. The dry jack is an important component to the stuffing, so don’t skimp on it! Preheat the oven to 425 degrees. Place the arugula, pumpkin seeds, cheese, 2 tablespoons of olive oil, and ¼ teaspoon salt into the bowl of a food processor and process until the cheese has broken down. The mixture will be very thick – you’ll need to stop the machine and scrape down the sides a few times with a spatula. Transfer the pesto to a bowl and fold in the diced pears. Set aside while you prep the chicken. Drizzle the chicken breasts with the remaining 1 tablespoon of oil and season them liberally with salt. Place the chicken breasts rib-side down on a cutting board and using a sharp paring knife, cut a pocket horizontally into the thickest part of the breast. Cut as deeply and widely as you can without letting the knife come through at the sides. 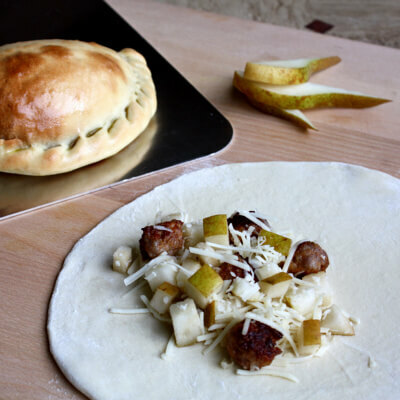 Stuff each pocket with approximately ¼ of the pesto and pear filling and secure the breasts, pocket-side up, with two pieces of butcher’s twine. Place the breasts into one or more pans so that they fit snugly and will not fall over during cooking. Transfer the stuffed chicken breasts to the oven and bake for 15 minutes at 425 degrees. Reduce the heat to 350 degrees and continue to roast until the chicken is fully cooked, 40-45 minutes longer. Remove the chicken from the oven and allow to cool for 10 minutes. Carefully snip the butcher’s twine and remove just before serving.